Bryce Canyon National Park Description. 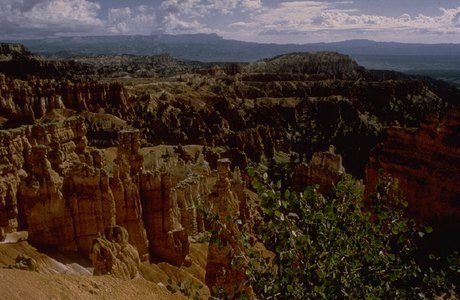 At Bryce Canyon National Park, erosion has shaped colorful Claron limestones, sandstones, and mudstones into thousands of spires, fins, pinnacles, and mazes. Bryce is famous for its worldly unique geology, consisting of a series of horseshoe-shaped amphitheaters carved from the eastern edge of the Paunsaugunt Plateau in southern Utah. The erosional force of frost-wedging and the dissolving power of rainwater has shaped the colorful limestone rock of the Claron Formation into bizarre shapes including slot canyons, windows, fins, and spires called "hoodoos." This area boasts some of the world's best air quality, offering panoramic views of three states and approaching 200 miles of visibility. This, coupled with the lack of nearby large light sources, creates unparalleled opportunities for stargazing.